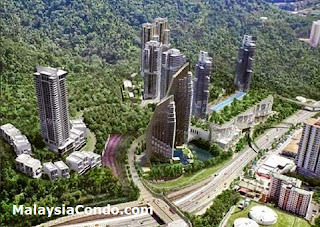 Quarza Residence the latest high-rise residential component of KL East development promises a holistic and yet urbane lifestyle experience with flexible range of unit sizes to cater for every individual or family. Comprising two 38-storey tower, nestled amidst a 53-acre rainforest park at the foothill of Titiwangsa Range, this natural wonder sanctuary is only 15-min drive from Kuala Lumpur City Centre (KLCC). A wide spectrum of facilities crafted for both the health enthusiasts and those who seek peaceful pleasures. Easy convenience of a shopping mall with trendy cafes and branded stores to shop, socialise and hang out, all right below your residence. Above it all, a spread of exhilarating activities awaits at the uniquely designed sky and rooftop garden featuring sky pavilion, games pod and many more that will heighten your everyday lifestyle.